The 7th Grade Division of the MDC was totally outstanding. A number of games came down to the wire and the talent was on full display. Here’s Part 2 of our Top Performers from the Class of 2019. Shawn Johnson Guard (Team Final)- Team Final were without leading scorer Kyhree Temple so Johnson decided to carry the load. The ultra-strong combo guard went on scoring rampage during the MDC. He scored 25 points against WE R 1 and 26 markers as they defeated eventual champion NY Rens in pool play. His play helped the Mid Atlantic champs reach the final four of the MDC. Kid was balling! Fahmir Ali Guard (Team Final)- Ali helped Johnson out with the scoring duties and displayed the play making ability that has him emerging as one of the top guards in the region. His passing is precise and he scored the ball when needed. He hit the big trey to that helped Team Final knock off the Rens and dropped 20 points in their final four lost to Metro Flyers. Bryant Antoine Guard (Team RIO)- Word has been circulating that Antoine has been tearing up the NYBL circuit and it must be true because he displayed some serious talent at the MDC. The combo has the build that most players would dream for and the skill set to go with it. He has driving ability combined with a soft jumper and athleticism. He was on a tear during the tournament until a head injury sidelined him during their semifinal showdown against NY Rens. Scottie Lewis Guard (Team RIO)- “The Show” was dynamic during pool play showing off his speed and athleticism in the open floor. These attributes also allows him to be a beast on the defensive end where he blocks shots and plays the passing lane. Moving forward more detail needs to be paid to his offensive production in the half court set and against different defensive schemes. Mikeal Jones Forward (Team RIO)- It was great to have Jones back on the main stage at a Spotlight event. This weekend he showed some flashes that earned him 6th Grade Player Of The Year. He went immediately to the post and carved out position for the pill. He used his soft touch and footwork to get the job done. I also like how he neutralized the shot blockers by throwing his body into their chest. That maneuver had him at the charity stripe all weekend. Ahmadu Sarnor Forward (Team RIO)- Sarnor tried to step up and match the NY Rens intensity in the semifinals. He was relentless in attacking the basket and converting in traffic. He went head to head with the tough guards from NY and played with huge pride in the loss. This kid is a warrior. 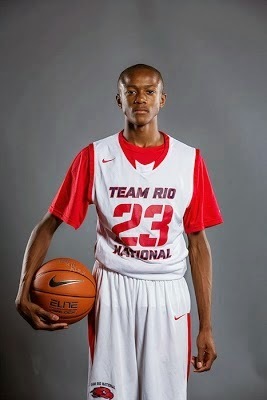 Seth Lundy Guard (WE R 1)- Lundy finally made his Spotlight appearance and it was well worth the wait. The silky smooth wing has the total package which includes size, skill and athleticism. He’s a total matchup problem because the guards were too small and the forwards were too slow. He tallied 17 points against Team Final and another 17 markers in their win against Team Nelson. Jamil Riggins Forward (Team Nelson)- Riggins kept his hot play going during the MDC. His athletic and aggressive style helped him drop 15 points against WE R 1 and 15 markers in their win versus Team Final. Jamil’s points were much needed as high scoring guard Mark Bradshaw was out nursing a leg injury.